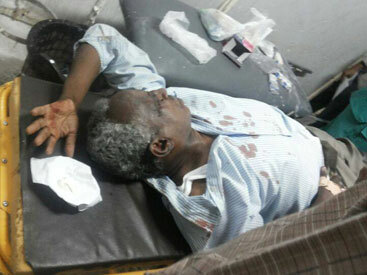 Khartoum, Sudan - The chief editor of a Sudanese newspaper was attacked and beaten by an angry mob late Saturday just days after a televised appearance in which he called for “normalized ties” with Israel. AFP is reporting that Osman Mirghani, editor in chief of Sudan’s Al-Tayar daily newspaper, was taken to Al-Zaytouna Hospital after the mob stormed the paper’s offices Saturday night. Friend and fellow journalist, Faisal Mohammed Salih, said about seven gunmen took over the paper’s offices just before Saturday evening’s iftar meal. “They ordered the journalists to lay down. They collected all the mobile phones and the laptops. They cut all the computer connections,” Salih said. Salih said he had spoken with an assistant to President Omar al-Bashir who visited Mirghani, and who told him that the journalist was still unconscious. For inciting the impetus for this violence ? , cause had he not mentioned "isreal"
or feel the need to beat him ! And now we all know why "moderate" Muslims don't speak up. Hey how come we don't hear a peep out of Obama or ban ki moon condemning this? We can't hear you!! !